Alfred Hitchcock had been a fan of John Buchan’s 1915 novel The Thirty-Nine Steps and had wanted to adapt it into a film for some time. The book was an engaging espionage thriller. However, when it came to film his own version, which was released in 1935, Hitchcock took little from the novel finding it not very cinematic in nature. When a brawl breaks out in a London music hall during Mr. Memory’s show, someone breaks it up by firing two shots from a gun. 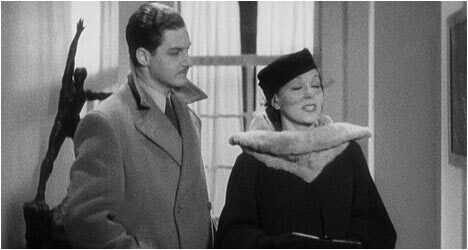 During the ensuing chaos Richard Hannay (Donat) meets Annabella Smith (Mannheim), a mysterious woman who accompanies him back to his hotel room. Once there, she acts unusually paranoid as if someone is following her. She tells him that it was her that fired the two shots because two men were trying to kill her. She claims to be a freelance spy currently employed by the British government. Hannay takes a look out one of his windows and sure enough there are two men standing out on the street. Later that night, Annabella staggers into Hannay’s room and dies with a knife in her back and a map of Scotland clenched in one hand. She was planning to meet a man there in regards to a very important secret and so Hannay decides to travel to the place she had circled on the map. The 39 Steps is a classic example of the man-on-the-run thriller with Hannay trying to elude the authorities and the two men that killed Annabella. We see Hitchcock’s knack for suspenseful action sequences, like how Hannay escapes his room without alerting the two spies, or how he evades the authorities on the train bound for Scotland. Even at this early stage in his career the Master of Suspense is able to get the most out of these sequences because we’ve become invested in Hannay’s plight. Robert Donat does a nice job as the innocent man thrust into a dangerous world full of intrigue. He brings a welcome light touch that Hitchcock utilizes occasionally and would anticipate future lead actors like Cary Grant and Jimmy Stewart who would eschew hard-boiled alpha males for more ambiguous takes on masculinity and effortlessly mix elements of comedy with drama. The 39 Steps is a vintage pre-Hollywood Hitchcock thriller and shows his progression as a master of the genre. Not only did he know how to successfully craft one but also use stylish misdirection to gloss over the plot holes or logical inconsistencies. He knew how these kinds of films worked and what audiences wanted to see, generating one crowd pleaser after another. There is an audio commentary by Hitchcock scholar Marian Keane. She points out elements in the film that make it one of the director’s quintessential thrillers and how it was so significant a film in his career that several echoes of it would appear later in North By Northwest (1959). She does a fantastic job analyzing Hitchcock’s style and the themes he explores in great detail. “Hitchcock: The Early Years” is a 2000 documentary short film that examines the director’s British films. We get a brief biographical sketch of where he was born and grew up. Hitchcock got into the British film industry during its infancy and eventually started making films. This is an excellent and informative look at his early work and his emerging trademark style. “Cinema: Alfred Hitchcock” features an excerpt from a 1966 British television interview with the director. He talks about his early films and learning about how to make them. Naturally, he talks about each of these films and how they came to be. “The Borders of the Possible” is a visual essay on The 39 Steps and Hitchcock’s style. We get a bit of background on the source novel and the director’s admiration for it. This extra takes us through the making of the film in detail. There is also a collection of production design sketches for the film that were done by O. Werndorff. They are juxtaposed with behind-the-scenes photographs and stills from the film itself. “Hitchcock-Truffaut” features audio excerpts from the 1962 interview that French filmmaker Francois Truffaut conducted with Hitchcock. The focus is on The 39 Steps and the director talks about what drew him to the novel and how he went about adapting it. Finally, there is the Lux Radio Theatre play version of The 39 Steps that aired on December 13, 1937 and starred Robert Montgomery and Ida Lupino. It offers yet another take on the material from the vintage time when radio shows were popular.